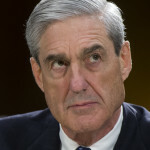 Special counsel Robert Mueller referred 14 cases of potential criminal activity to outside offices because the cases were “outside the scope of the special counsel’s jurisdiction,” according to the Mueller report. Special counsel Robert Mueller’s team was not pleased with the written interview that President Trump gave in response to their questions, but elected not to subpoena him to avoid drawing out the investigation. White House counselor Kellyanne Conway on Thursday compared special counsel Robert Mueller’s investigation to a “political proctology exam” on President Trump who emerged from the metaphorical procedure unscathed. 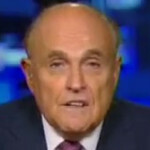 Rudy Giuliani has been busy. He spent the last two nights reading special counsel Robert Mueller’s 400-plus page report in a private room at the Justice Department. 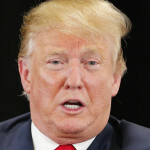 As the rest of the public pores over the report on Thursday, Trump’s legal team is in full spin mode, deriding the standard of proof that Mueller’s team used to assess the obstruction case and pushing the “investigate the investigators” talking point. 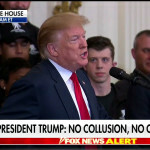 President Trump savored the friendly crowd of wounded warriors gathered at the White House on Thursday to bask in his “good day,” following the attorney general’s hearty defense of Trump and his campaign during a presser before the release of special counsel Robert Mueller’s redacted report. President Trump thinks he’s in Westeros, again. 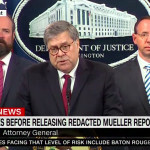 President Trump did not assert his executive privilege to get any information redacted in special counsel Robert Mueller’s report, Attorney General William Barr told reporters on Thursday. 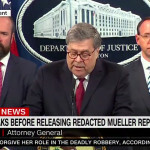 In his press conference before delivering special counsel Robert Mueller’s redacted report to Congress, Attorney General William Barr reiterated his previous assessment that there was “no collusion” between the Trump campaign and the Russian government or Russian trolls to influence the 2016 election. 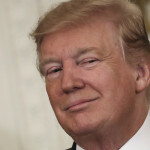 “In other words, there was no evidence of the Trump campaign collusion with the Russian government’s hacking,” he said, making similar comments about the efforts of Russian trolls to interfere in the election. 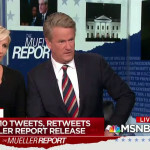 Former Republican congressman-turned cable news host Joe Scarborough savaged Attorney General William Barr on MSBNC’s “Morning Joe” on Thursday morning, less than an hour before Barr is scheduled to hold a press conference on the release of special counsel Robert Mueller’s report. 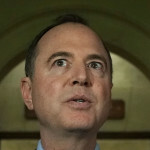 House Democrat committee chairs issued a joint statement on Wednesday evening calling on Attorney General William Barr to cancel his “inappropriate” press conference — which he plans to Thursday morning before the Mueller report is delivered to Congress — calling it a partisan attempt to shape the public’s perception of the investigation.